Mulund, Mumbai, Sept 5th 2017: Excellent time management and swift coordination between Clinicians, Medical Social Workers and Nursing Teams across Surat and Mumbai, helped saving the lives of a 3.5yr old and 38yr old female, today. The Zonal Transplant Coordination Centre (ZTCC) Mumbai and Pune, National Organ & Tissue Transplant Organization (NOTTO), Regional Organ and Tissue Transplant Organization (ROTTO) along with the Traffic and Police authorities worked in perfect tandem to enable these lifesaving transplants within 1.5hrs, in Mumbai. The donor heart of the 14month old from Surat was retrieved by Fortis Hospital, Mulund’s retrieval team; the little boy was rushed to New Civil Hospital, Surat, after he suffered a fall while playing. 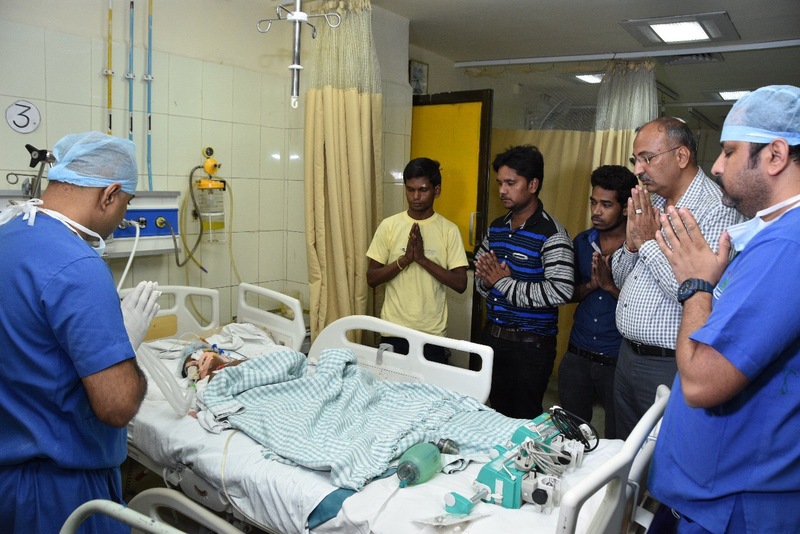 He was subsequently declared brain dead, after which, his family was counselled by Nilesh Mandlewala, President, NGO Donate Life. The toddler’s 27yr old father and 24yr old mother consented to donate his Kidneys and Heart, saving three lives; this also makes him the youngest ever donor in Western India. The Kidneys were transported to the Institute of Kidney Diseases and Research Center (IKRDC), Ahmedabad and the Heart was transported to Fortis Hospital, Mulund, Mumbai via a Green Corridor, through a commercial flight covering a distance of 331.7Kms in 1Hr and 25Mins. The recipient is a 3.5yr old female resident of Kalamboli, Navi Mumbai, who was suffering from Dilated Cardiomyopathy and was waitlisted in since August 2016. Over the past year, doctors at Fortis Hospital, Mulund, her parents, NGOs, Govt. bodies and trusts made appeals and hosted Organ Donation camps, so she could get a heart. The cadaveric donation at Sir JJ Hospital, Mumbai, witnessed the husband of a 45yr old housewife, consenting to donate his beloveds Heart, Liver and Kidneys. A resident of Karjat, the mother of two was rushed to the hospital after she fell unconscious due to the shortage of blood supply to her brain. She was declared brain dead and her Kidneys, Liver and Heart were subsequently retrieved; this marks Mumbai’s 39th Cadaveric Donation of the year 2017. Retrieved by the team from Fortis Hospital, Mulund; the donor Heart was then implanted into a 38yr old female recipient from Kharghar, Navi Mumbai. The recipient was diagnosed with Dilated Cardiomyopathy in June 2016 and was put on the waitlist in March 2017. The Heart was transported to Mulund by road, via a Green Corridor enabled by Mumbai’s Traffic and Police authorities, covering a distance of 31Kms in 23Mins. Speaking of yet another milestone achievement in medical history of the state, Dr Anvay Mulay, Head of Cardiac Transplant Team, Fortis Hospital, Mulund, who conducted both the transplants said, “Our team of medical experts, Medical Social Workers and Nursing Units have enabled the two landmark transplants within a tiny timeframe; this would not have been possible without their relentless focus and determination to enable these transplants. We would not have been able to reach this far without the consent by the kin’s families, who have forever changed the lives of the recipients and their families. The surgeries have been concluded and the patients are now stable”. Talking on yet another account of clinical excellence, Dr S Narayani, Zonal Director, Fortis Hospital, Mulund, said, “We salute the brave parents of the 14month old boy from Surat and the husband of the 45yr old female from Karjat, for consenting to donate; their kin lives on in the form of the recipients. All stakeholders, especially media played an important role in advocating the cause of Organ Donation, which helped sensitize the community. There has been a considerable rise in the number of cadaveric donations this year, we hope to keep progressing on that front to help more such patients of end-stage organ failure”. The donor heart from Surat was transferred out of New Civil Hospital at 07.35AM, reaching Surat airport at 07.45AM, it was then transferred into a commercial flight that took off at 07.55AM. The team carrying the organ landed in Mumbai at 8:40AM. Green Corridor was laid between Mumbai Airport and Mulund, covering 21Kms, enabled the organ transfer to Fortis Hospital, Mulund at 09:00AM. While the donor heart from Sir JJ Hospital was transferred out of the premises at 10.09AM, following the Green Corridor covering 31Kms by road to reach Fortis Hospital at 10.32AM. Very good work. Thanks for posting it.